Place pork on cookie sheet or shallow roasting pan and cook until 165 degrees. In medium saucepan, combine apples, cranberries, barbeque sauce, sugar and water. Slice pork and spoon sauce over the top. 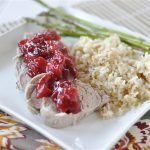 Pork Tenderloin with Apple Cranberry Sauce was originally written by Leigh Anne Wilkes at https://www.yourhomebasedmom.com/pork-tenderloin-with-apple-cranberry-sauce/.